Whether your company specializes in oil exploration, manages existing fields or operates a refinery, InstantSign can help you create vibrant signage indoors and out. Our tough, durable signs and graphics will identify your equipment, inform employees and visitors of safety policies and promote your company's reputation. Even on offshore drilling platforms, our graphics can ride out the roughest conditions. Expert installation ensures you banner receives the proper attention it deserves. Big, bold banners draw attention from a distance, identifying your rig or worksite and promoting your company's name. Identify all your vehicles with permanent vinyl graphics or convenient magnetic signs. Easy-to-read signage helps direct traffic, control parking and point drivers in the right direction. Meeting OSHA signage requirements helps protect both employees and customers throughout a place of business. Bold, legible window lettering puts your hours of operation and other essential facts in plain view. 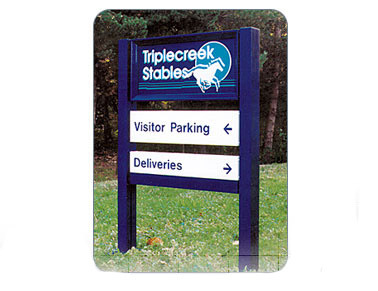 Larger signs are easier to see from a distance, and by adding borders and extra colors, you can help potential customers read and remember your message.